The seems to have been a shift (I think school is a big influence) in whether families celebrate Easter or not these days. This is the first year that Fin has really been into it, and it seems to have been commercialised even more this year; everywhere you look there are bonnets, eggs, bunnies, chicks and chocolate. I mean, I’m not complaining, I’m pregnant, so I am really into chocolate at the moment! This shift in enthusiasm for Easter has caused me more life admin than I need, though. I’ve had to make an Easter bonnet (which was one of the winners at Fin’s school – life made! ), organise an Easter egg hunt, and search high and low for dairy and soya free chocolate eggs… I didn’t find any because I left it too late. Anyway, back to the reason I am writing this post! We spent a lovely afternoon with a very large bunny, and a very engaging Mad Hatter, decorating egg-shaped biscuits, chowing down on delicious sandwiches and cakes, and searching for facts about rabbits! The Mad Hatter ushered us over to a special part of the garden centre cafe, which was decorated nicely for the kids to enjoy. Each table setting had a biscuit, some sprinkles and some writing icing, some crayons, and an activity sheet. This kept the kids occupied for a while whilst the food was served. The kids chose a picnic bag (in advance) which had some tasty bits in, including cheese sandwiches, crisps, jelly and a pack of raisins, and us adults had a really delicious afternoon tea. It had 2 finger sandwiches, a massive scone with cream and jam, a salted caramel tart and a chocolate brownie with some strawberries. Everything served was really tasty, and we had to be rolled out of the centre after all of that! Related: The New PJ Masks Magazine: Catboy, Owlette & Gekko Have Landed! During the chowing down, and the crafty bits, the Mad Hatter engaged the kids, and introduced the Easter Bunny, who was busy arranging the Bunny Hunt. Even at the age of 5 and 6, the boys really enjoyed the engagement, and had a great time. 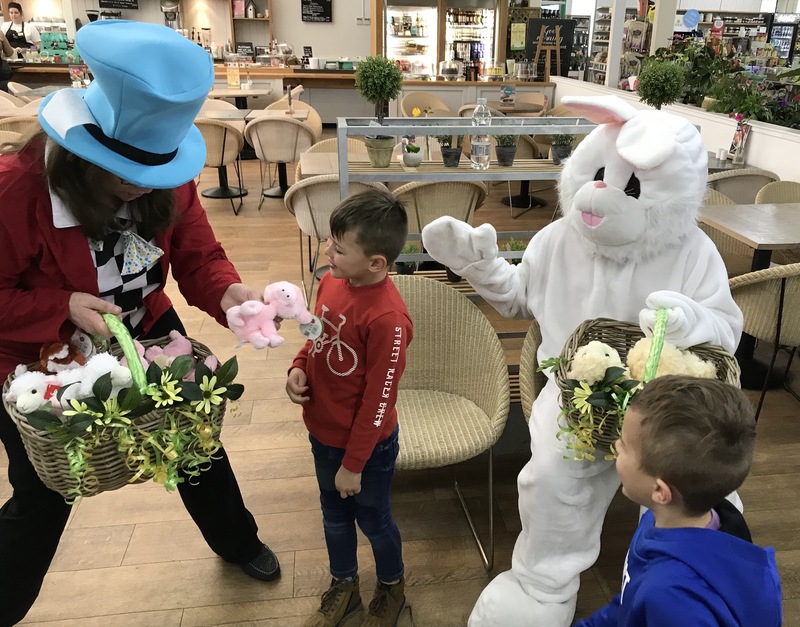 After we had spent some time in the cafe, we left any uneaten food in our area, and made our way to follow the kids led by the Easter Bunny around the centre. It was the first time I’d been to the garden centre since meeting Santa there last December, so it was nice to see how they transformed the area for this event. The kids had to try to find bunny facts, and in return for finding each fact, they got a sticker for their sheet, and a chocolate egg. By the end of the hunt (about 15 minutes), the kids stashed 4 little eggs in their bags, and were presented with a basket full of Easter-themed soft toys to choose a toy from at the end. The boys both chose a fox. We all had a really nice time, and the boys had a great afternoon of surprises. For £10.95 per child, I think this is a really reasonable event to attend, and comes highly recomended by us adults, too. The New PJ Masks Magazine: Catboy, Owlette & Gekko Have Landed!